'Ribonut' hangs signs welcoming President Trump, reminding him that 75% of Israelis support applying sovereignty to Judea and Samaria. 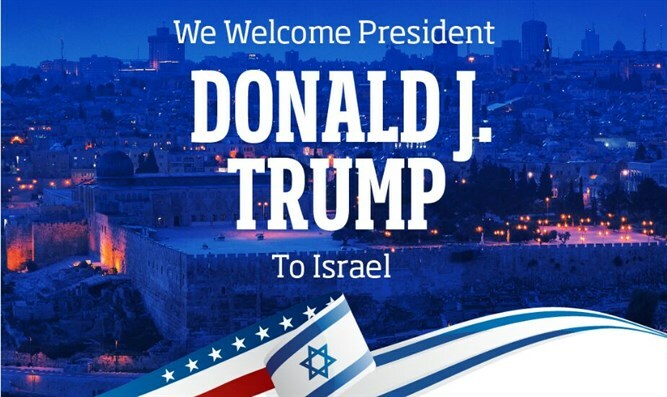 In honor of the fiftieth anniversary of Jerusalem's unification and US President Donald Trump's visit to Israel, the "Ribonut" movement has launched a campaign to encourage applying Israeli sovereignty to Judea and Samaria. "Ribonut," literally "sovereignty" was founded by the "Women in Green" movement. In preparation for Trump's arrival, Ribonut is hanging huge signs across the capital, welcoming the visiting President. The signs also note that 75% of the Israeli public supports applying Israeli sovereignty in Judea and Samaria, whether as part of an autonomous plan or as part of a longer and more comprehensive plan. On their website, Ribonut will display a project in which they meet and interview Judea and Samaria leaders, speaking about the small, personal stories of the leaders who have built Judea and Samaria over the past fifty years. Among the stories told is how Rabbi Levinger and Rabbi Waldman were sharply reprimanded by Minister Yigal Alon; how a group of women snuck into Hadassah Hospital in Hevron; why Yisrael Harel refused to apologize to Menachem Begin; and which teacher became a regional leader. According to Women in Green leaders and Ribonut founders Yehudit Katsover and Nadia Matar, Ribonut will begin publishing a newsletter, which will be sent to thousands of supporters in Israel and abroad. The newsletter will include updates about Ribonut's activities, articles, and material from the movement's website. "The liberation of Jerusalem, Israel's heartland, and the Golan, strengthened Israel's independence. Now, fifty years later, Israel can take its independence and sovereignty to another level," Katsover and Matar said. "The celebration of fifty years since the liberation of Jerusalem, fifty years since we returned to where our nation began, together with the change of atmosphere in the White House - all of these can and should create a base for the first diplomatic steps towards returning Israel to the Zionist dream of safely and responsibly being a sovereign ruler in our own land."